Early harvest pears have arrived! Kiddo loves pears but they always arrive less than ripe from the store. 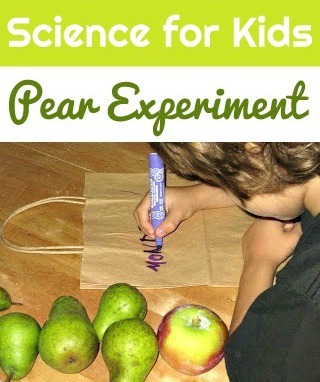 Instead of complaining about it, we turned our bag of underripe pears into a simple science project. Put several of the pears in a bag with an apple and labeled it with the date. Leave the remaining pears out on the counter. Check the pears every day to see which ripens faster. Kiddo decided that the pears in the bag ripened one day sooner than those on the the counter. The difference becomes more pronounced the longer you let the pears ripen (if you can wait that long to eat them). In any case, he gobbled them up. Oregon State U extension has some interesting facts about pear ripening (and why the apple in a bag method works) . Mr Putter and Tabby Pick the Pears is one of the funniest books in this easy reader series! My kids laugh and laugh as Mr. P. and Tabby slingshot pears over the fence. Too Many Pears! I love this book about a pear-loving cow. You can get it in several bi-lingual editions, but oddly it is no longer available in just an English editions. « Transportation Tuesday, or Could I Just Sit Down for One Minute, Please? My mom always put bananas in a bag to ripen like this! I learned something new today – never heard of ripening pears in a bag before! I love to see your ideas! Yaa I always keep the apples away from the bananas b/c they ripen them too quickly before we can eat them! I love the simple experiments! This sounds like a fun way to work with science…and then get to eat it at the end (best part! lol!). The eating is definitely my favorite part!